Rick Reiff is the former editor of the Orange County Business Journal. 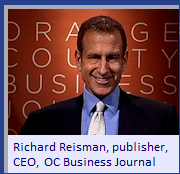 Here he talks with Richard Reisman about Reisman's work as longtime publisher of the OCBJ. To view this Videocast, click photo, left, or video icon below. Mohamed El-Erian is the Chief Economic advisor to Allianz, following serving as CEO and co-CIO of PIMCO, a subsidiary of Allianz. He is a former faculty member of the Harvard Business School and one of the most highly respected commentators and authors following global economics and investments. *this episode is 78 minutes. One of the most exciting developments going on in our community is the making of a world class children’s hospital. Meet the CEO who is making this dream possible. Richard's guest this episode is Kimberly Cripe, has served as CEO of Children’s Hospital of Orange County. When she took the helm in 1997, stories about CHOC were all about financial problems. Today, it is on the verge of completing a 425,000 square foot tower that will make it best of breed. On June 5, Kim delivered the Keynote address to over 800 people at the Business Journal’s annual Women in Business luncheon at the Irvine Hyatt. Orange County boasts a robust hi tech industry, many of which being on the cutting edge. Meet the CEO of one of OC’s leading technology companies. Richard's guest this episode is Jim McCluney, the CEO of Emulex Corporation, headquartered in Costa Mesa. Approaching $500 million in annual sales, Emulex is growing at a double digit clip. Orange County has some great leaders who are navigating the challenging waters of health care delivery. Richard's guest this episode is Dr. Rick Afable, CEO of Hoag Memorial Presbyterian Hospital, a jewel in the county’s health care system. With $650 million in revenues, it is the largest local, independent, hospital based medical provider. Recently, Dr. Afable was named one of the 50 most influential Physician-Executives in America by a prominent national publication. Is this a great country or what? Starting his 3rd successful on-line mortgage direct business, Richard's guest this episode already has 500 employees in Orange County. Anthony Hsieh is the founder of LoanDepot.com, a direct mortgage lender that is already originating $250 million or more in home loans per month. In addition, Anthony’s competitive sport fishing team is number one in the world. We may not be Silicon Valley, but Orange County does have its own venture capital firms. Meet the founder and managing director of a home-grown, successful venture capital firm. Richard's guest is Bruce Hallett, founder and managing director of Miramar Venture Partners. Starting his career as a corporate lawyer, where his clients included high profile clients like Broadcom Corporation, Bruce founded his Silicon Valley-styled venture capital firm almost 10 years ago. In his spare time, Bruce serves as a member of the Regents of the University of California. He runs one of the two most valued public companies in Orange County. Analysts project revenues this year will exceed $6.5 billion, more than double what they were when he took the helm in 2005. Richard's guest is Scott McGregor, president & CEO of Broadcom, headquartered in Irvine. Scott’s career has always had him at the center of the high tech action. In communications chips that would put him at Broadcom which today boasts a market value approaching $20 billion, over 1 ½ times what it was when he arrived. Out of the 200 million Americans who are covered by private healthcare insurance, the enrollment and claims of nearly 130 million of them are touched by the software and services provided by the company this guest founded a little over 12 years ago. Meet one of the few Americans who actually understands all the moving pieces of our healthcare delivery system. Richard's guest is Jeff Margolis, founder, chairman and CEO of TriZetto Group Inc. Founded in 1997, TriZetto was recently acquired by private equity firm Apax Partners for 1.4 billion dollars. Imagine running the family office for one of Orange County’s biggest names, being CEO of the Ducks, Chairman of the management company for the Honda Center and overseeing over $200 million of charitable giving. Meet the man who does all this, in this month's episode of the Cable Business Journal. Richard's guest this month is Michael Schulman, the man who oversees the business, personal and charitable activities on behalf of Henry Samueli, the founder and chairman of Broadcom, and his wife Susan. With an initial investment of $2,000, the company he started today commands a market cap of $15 billion. Meet this recipient of the Business Journal’s Excellence in Entrepreneurship award in this current episode of the Cable Business Journal. Richard's guest this month, Shelly Razin, is the founder and chairman of Quality Systems, Inc. He finds himself today at the vortex of the health care debate as his company, among other things, is a leader in the world of Electronic Medical records, a big priority in health care reform. Shelly also received the Business Journal’s award last year at our Excellence in Entrepreneurship program. In Orange County, there is only one family who have been leaders in the real estate development going back a century. Our next guest’s daughter recently joined him in the family business, which would make this a 5 generation family owned business. Virtually, unheard of. Meet Brooke’s Dad in this episode of the Cable Business Journal. Richard's guest this month, Brandon "Brandy" Birtcher, is the Fourth generation in OC’s most significant family owned real estate enterprise. Constantly, reinventing himself, Brandy continues to navigate the rough waters his industry now finds itself in. Recently, Brandy’s daughter Brooke, joined the company, making it a 5 generation family business, which the Business Journal has recognized in its annual Family Owned Business program. The #1 company in aesthetic medicine is headquartered in Orange County. It's products include Botox Cosmetic, Juvederm, Latisse, Natrelle and the Lap Band. Meet the dynamic, young president of this enterprise, in this episode of the Cable Business Journal. 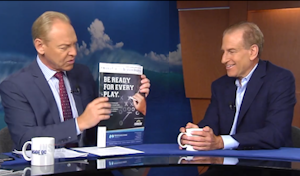 Richard's guest this month is Robert Grant, President of Allergan Medical. Robert was recruited by Allergan in the spring of 2006 to oversee the largest medical aesthetics business operation in the world. Competing with giants like Johnson & Johnson, Robert's division of Allergan is the clear leader in its category. With a five-figure speaking fee and a book that got into the Amazon top 100, she may be the most dynamic female speaker & trainer in the country. Meet one of the Business Journal’s recent winners of our outstanding Women In Business Program in this episode of the Cable Business Journal. Richard's guest this month is home grown Terri Sjodin, having attended Masuda Elementary School, Fountain Valley High School, Orange Coast College and San Diego State. One of her first assignments as she started her own sales training career was to train the sales force at the Orange County Business Journal over 15 years ago. Today Terri is a widely recognized speaker and trainer, advancing the persuasive presentations skills of sales people, CEO’s and even Members of Congress. Great Beer, Good Eats and Rock and Roll. Hear how you can take these 3 simple, but wonderful things, and create a business that earned our next guest the Business Journal’s Excellence in Entrepreneurship recognition, next on the Cable Business Journal. Richard's guest this month is Steele Platt, the founder and CEO of Yard House, one of the hottest restaurant concepts in the country and performing exceedingly well, even in the current economic climate. Looking for a fun crowd? You’ll still find it at any Yard House. Richard's guest, Joe Kiani, is the stuff movies are made of. Born in Iran, not only is he a poster boy for the American dream, but his success story involves positive results from so many of our institutions: Our free press, Congress, our judicial system, our capital markets. Of course it starts with Joe’s innovation of a break-through medical device technology, and it wasn’t easy, but today Joe and the company he founded, Masimo, are a huge success. Not only has the Business Journal awarded Joe with it’s Excellence in Entrepreneurship award, but he was also recognized as the Business Journal’s Business person of the Year for 2007. Richard's guest this current episode is Alan Gladstone, the founder of Anna’s Linens, named after his mom who worked to instill her values on the company until she passed away a few years ago. Today this home furnishings retail business has over 250 locations, over 2500 employees and continues to grow, even in this challenging economy. Last year, the Business Journal recognized Anna’s Linens as a winner of our Family Owned Business Award. Meet this wonderful man who started this retail business 20 years ago, with over $350 million in sales today. Growing up in suburban New Jersey Richard's guest had a successful career in the billboard industry then he had drinks with a former fraternity brother and was offered a dream job. Meet this exciting executive who runs a business known to everyone in Orange County. Richard's guest this month is Dennis Kuhl now serving in his fifth year as the President of the Angels. After a highly successful career in the billboard industry, Dennis along with owner, Artie Marino, have made the Angels baseball franchise the sixth most valuable in all of Major League baseball, according to Forbes magazine's rankings. There are over 160 nominees for the Business Journal's Women In Business Awards program this year. This month's guest is one of those who has been recognized at that event. Richard's guest is Gloria Zigner, someone who has touched many lives in Orange County, starting with Pilar Wayne, and in recent years the children of CHOC Hospital. Gloria has also been recognized by the Orange County Business Journal as one of the outstanding women in business in Orange County. At 21 years old this entrepreneur started his business because an injury made it impossible for him to continue on his job. At 33 years old he was recognized by Ernst & Young as an Entrepreneur of the year. Meet this dynamic real estate developer who is about to open a new hotel and health club facility in Aliso Viejo. Richard's guest this month is Bob Olson, Founder and CEO of R.D. Olson Development and R.D. Olson Construction. At 25 years old, Sonny Bono hired Bob to build his dinner house in West Hollywood which launched his hospitality based construction company into the big time. Over the last 10 years, Bob has had been an active developer of hotels and other properties, with an exciting Renaissance Club Sport Hotel and health club scheduled to open this summer in Aliso Viejo. Last spring Bob was recognized by the Orange County Business Journal with it's Excellence in Entrepreneurship Award. Richard's guest this month is Lindsey Ueberroth, Vice President, Brand Development of Preferred Hotel Group, a highly successful hospitality company with 600 hotel clients. Lindsey and her family are getting a lot of recognition these days, not least of which was the Orange County Business Journal Family Owned Business Award. 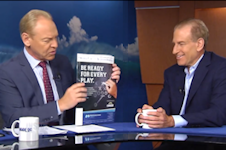 Richard's guest this month is Scott Flanders, CEO of Freedom Communications, one of the largest privately held media companies in the country, with substantial holdings in Orange County including the Orange County Register. Starting as a tax attorney in Indiana, Scott finds himself today at the vortex of many of the headline-grabbing issues reported on a daily basis in the business press. He has been called the Henry Ford of the exercise industry. Today he is battling a deadly disease on behalf of himself and everyone else, revolutionizing medical R&D. Meet one of the most accomplished and inspirational people I've ever had the pleasure to meet, next on the CBJ. Our guest this month is Augie Nieto, who while still an undergraduate at Claremont McKenna College, founded Life Fitness. Today Life Fitness is the largest commercial manufacturer of fitness equipment in the world. But as accomplished as Augie has been in business, it was his current endeavor that landed him on the front page of the Wall Street Journal. He calls it Augie's Quest and it's about finding a cure for ALS. Using the same skill set that made him a business giant, Augie is setting about to fundamentally reform the model of how medical research is conducted in this country. As viewers of this show know, Orange County is full of national leaders in the real estate community. Richard's guest this month is a prime example of that. Meet the CEO of one of the nation's top 25 commercial real estate buyers. Chuck Schreiber is the CEO of KBS Realty Advisors and KBS Real Estate Investment Trust. KBS is one of the nation's top real estate advisors, having acquired over $7 billion in real estate investments on behalf of leading public and private pension funds. KBS has created 23 real estate investment funds since the company started in 1992, and has also launched a publicly-offered, non-traded Real Estate Investment Trust that was declared effective in early 2006. Richard's guest this month is Camille Jayne, Chairman and Founder of Matters At Hand. Camille has had an amazing career that has involved serving as an executive in several public companies, including a 4 year stint at Universal Electronics as CEO, presiding over a dramatic turnaround. Richard's guest this March is Joel Moskowitz, founder and CEO of Ceradyne, Inc. With a market cap now of about 1.5 billion, Ceradyne has been one of the best performing stocks in the country over the last ten years. Joel has been recognized by Ernst & Young as Entrepreneur of the Year and has built a company from scratch that truly makes a difference. One of the leading hotel companies in the country is headquartered right here in San Clemente. With an enterprise value of 3.5 billion dollars, this fast-growing company has recently acquired two hotels in Times Square, the "W" Hotel in San Diego, and the Century Plaza in Los Angeles. Come meet the dynamic CEO of this industry leader in this month's Cable Business Journal. Richard's guest this month is Bob Alter, CEO of Sunstone Hotel Investors. Just over three years ago Sunstone raised over 400 million dollars in the largest hotel IPO ever, and today has a market capitalization of over 1.5 billion dollars. Last year Bob was recognized by the Business Journal at our Excellence In Entrepreneurship Award program. Learn how this accomplished businessman is helping to shape OC's future. Richard's guest in January is Craig Atkins, co-founder and CEO of O'Donnell/Atkins, the largest land brokerage firm in California. In 1992, while still in his 20's, Craig formed the firm with his partner, Mack O'Donnell. With transactions today in the neighborhood of $1.5 billion annually, Craig was recognized by the Business Journal with its EIE Award. The world of daily newspapers is changing dramatically as the media landscape shifts. How does all this impact us in Orange County? Find out from an industry leader who stands in the middle of the action here in Orange County. Richard's guest this December is Chris Anderson, Publisher and CEO of the Orange County's daily newspaper, the OC Register. Chris joined the Register as editor in 1980 and is widely credited with overseeing a dramatic improvement of its editorial content. He has been named Editor of the Year and is the past President of the American Society of Newspaper Editors. The Orange County Business Journal recognizes Chris as a member of the OC 50 - one of the most infuential businesspeople in Orange County. Learn how this accomplished businessman is helping change OC's future. Come meet a man whose vision is transforming one of the largest business schools in the US. Tune in and see this inspiring academic who recently addressed an large room of OC business leaders to present his 2007 economic forecast for Orange County. Richard's guest this month is Dr. Anil Puri, Dean of the College of Business and Economics at Cal State Fullerton. The business school is ranked third or fourth in size in the US, graduating over half of all the business school graduates in OC. It is now the second largest university in the entire state of California. With almost thirty years of service Anil has had a lot to do with the emergence of this great institution. Richard's guest this time is Henry Segerstrom, Managing Partner of C.J. Segerstrom & Sons, a diversified real estate development and management firm whose most high profile property is South Coast Plaza. The Segerstrom family came to Orange County before the turn of the 20th century and Henry's grandfather surely wouldn't recognize the place he immigrated to from Sweden were he to see it today. Right now is an extremely exciting time for Henry because his long term vision of adding a world class concert hall to the Segerstrom Center for the Arts is becoming a reality. Richard's August guest could qualify for who's who in the world on many fronts. Milan Panic, an Olympic athlete for his native Yugoslavia, defected and within 10 years of establishing a pharmaceutical house in 1959,saw it rise to the Fortune1000 in 10 years. ICN also developed the second highest selling biotech drug in history and at one time was the leading drug company through joint ventures in Yugoslavia and Russia. Still, in 2002 he lost control of ICN and now wants to throw out the folks who are now in charge. By the way, Milan also served as prime Minister of Yugoslavia in the early 90's. Richard Reisman's guest this month focuses her attention on Orange County's economic development and prosperity in order to preserve a high quality of life. She has taken on her current position after running the California Housing Department under Governor Schwarzenegger. Lucy Dunn, was selected to serve as the President of the Orange County Business Council after a career in the home building industry. Previously, Lucy served as the director of the California Dept of Housing and Community Development. Now as OCBC's president, Lucy is focused on some of the county's most pressing business issues. One of he council's top initiatives is improving Orange County's infrastructure with a special focus on transportation. Meet this influential Orange County businesswomen in this July edition of the Cable Business Journal. Honoree, Women in Business Awards. The biggest business event of the year for the Orange County Business Journal is the Women in Business Awards held each May. With 150 nominees each year, it takes an extraordinary person to emerge a winner. Meet one of these extraordinary women, on this edition of the Cable Business Journal. Michelle Jordan, Principal & Founder, Jordan LLC Strategic. Communications, was a big time public relations executive associated with some of the biggest national firms and Fortune 500 clients. As more and more women choose to do, in 1998, Michelle decided to go it alone. She specializes in "reputation management" and counts a blue chip roster of clients. Listen to how Michelle rose to prominence in OC, in this June edition of the Cable Business Journal. In a recent article in the Orange County Business Journal we identified our next guest's company as the one which will most shape the look of Orange County over the next decade and beyond. Emile Haddad is President of the Western Region of Lennar Corporation, one of our nation's top three home builders. Lennar is currently developing the former El Toro Marine Base dropping a new high-rise downtown near Angels' Stadium in Anaheim and generally changing the face of Orange County. The Orange County Business Journal just named Emile, along with his colleague, Jon Jaffe, as Businessperson of the Year. Meet this very influential OC executive in this May edition of the Cable Business Journal.